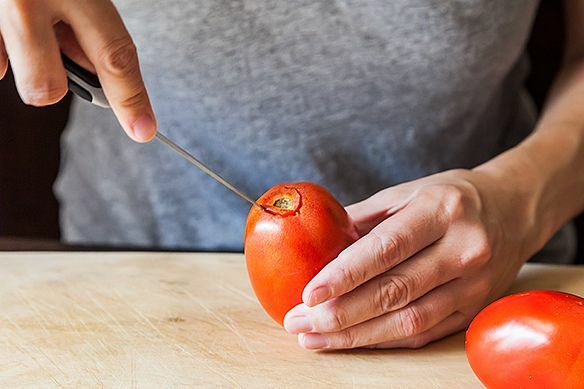 Today: Capturing all of tomatoes' greatness, to the last drop. Tomatoes may be the most fickle of summer produce. Year-round, you can probably find an acceptable zucchini or eggplant or cucumber, if you really couldn't wait. Frozen sweet corn suffices. And does anyone really miss just-picked okra when it's gone? But a ripe tomato will never be right, unless it's hot outside and has been for a good long while. Why else would we dedicate the better part of a grocery aisle to canned tomatoes in every form? So you can't let a single good one escape. 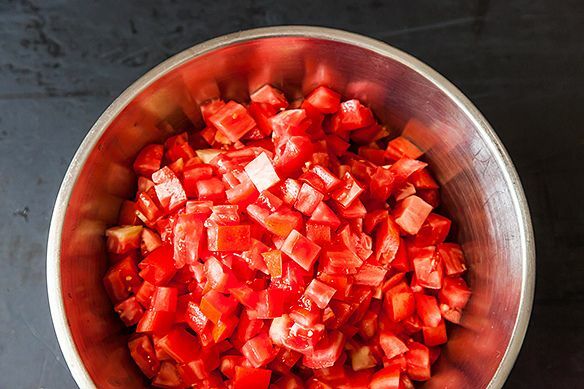 When you're not packing your BLTs with slabs of the best ones, or spooning brown butter over them, Sarah Leah Chase has a good place to stick them: Scalloped Tomatoes. The result is a bit like making a simply perfect tomato sauce, then eating a big bowlful without the distraction of pasta. It's mostly tomatoes, sharpened with a little garlic and basil, with just enough bread tossed in to sop up the juices. And some cheese on top, because cheese is always good on top. 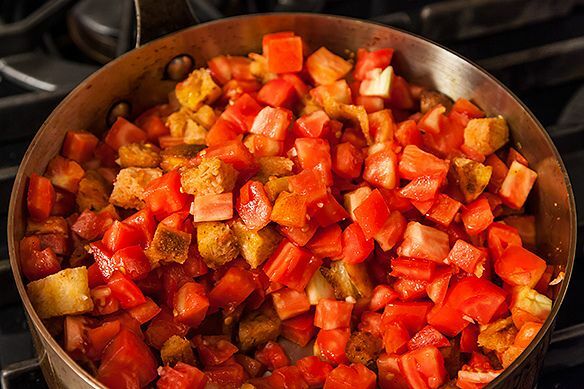 Merrill called it "hot panzanella". Ina Garten loved it, adapting it herself, although she toasts the bread cubes in olive oil instead of bacon fat. To each her own fat. Deb Perelman from Smitten Kitchen puts a poached egg on top. And it was sent my way by FOOD52er chefpatty (thanks for the tip!). Often we think of scalloped dishes (a.k.a. gratins) only in terms of potatoes, which grasp onto any liquid they can find and thicken up of their own accord. 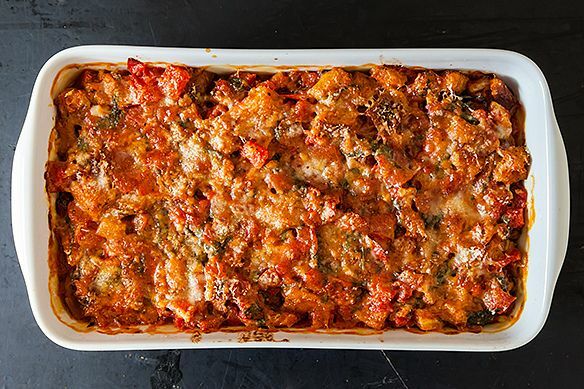 But juicier vegetables can be gratinéed too -- you just need a plan for all that liquid. You can salt them to draw out what you can, or throw in some par-cooked grains -- or, as you see here, bacon-toasted croutons. 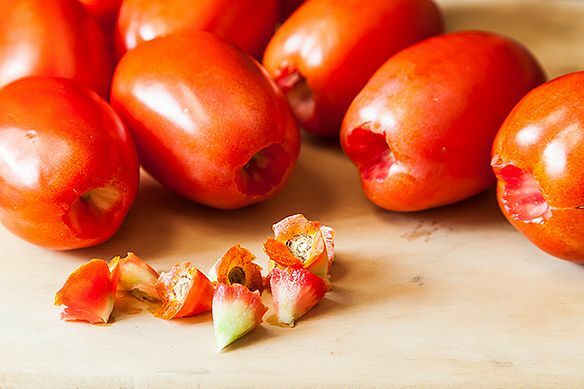 Unlike the slow-roasted family of tomato recipes, in which they are gradually transformed into candy, this one is cooked at high heat, and barely so. It tastes like little more than a fresh, ripe tomato, warmed up. Chase even adds two tablespoons of sugar to the casserole to compensate, but I've decided that you don't need it. -- Chase calls for romas, but use the best tomatoes you can find -- beefsteak will be juicier, but not problematically so. Throw in another handful of bread cubes if you want. -- Use a skinny baguette, so you get more cubes with crusty edges -- they're fun to bite into. -- And finally, don't go crazy with the cheese and basil -- you want this to be all about the tomatoes. 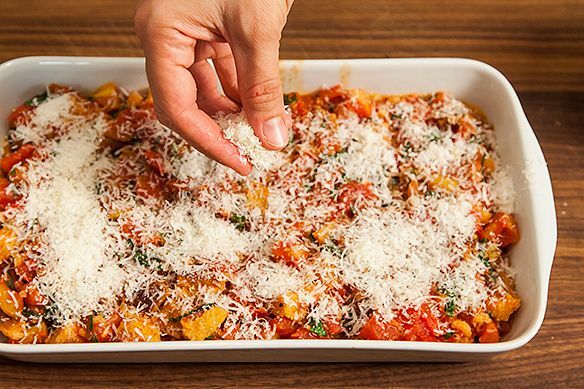 Pack the basil into its half cup lightly and, if you're developing a thick layer of cheese on top (this will depend on your baking dish), just stop. Eat any extra cheese or feed it to the dog. Such a wonderful use of summer's bounty of tomatoes. I used olive oil rather than the bacon fat to keep the clean flavor of the tomatoes. 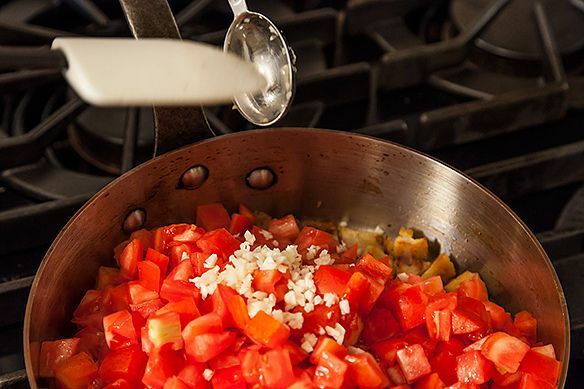 Quick and simple to make, this recipe condenses the tomato flavor. 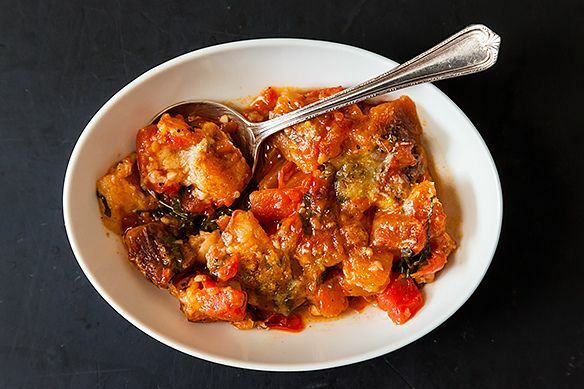 I've used Sarah Leah Chase's Cold Weather Cooking for years. A real jewel! Made this yesterday with some Indian 'Pav Bhaji' spice (threw in some diced sweet onions and ginger garlic paste)..It was awesome. 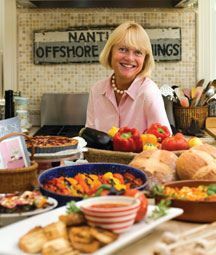 thank you Sarah Leah Chase for this great recipe! Holy moly, this was fantastic. I was too lazy to render bacon fat, so I used olive oil and swapped a handful of smoked mozzerella for some of the parm. Thanks for digging this one up chefpatty and Kristen. Can't wait to make it again. Had this with grilled sausage for dinner tonight. It was a hit with everyone. Oh my. 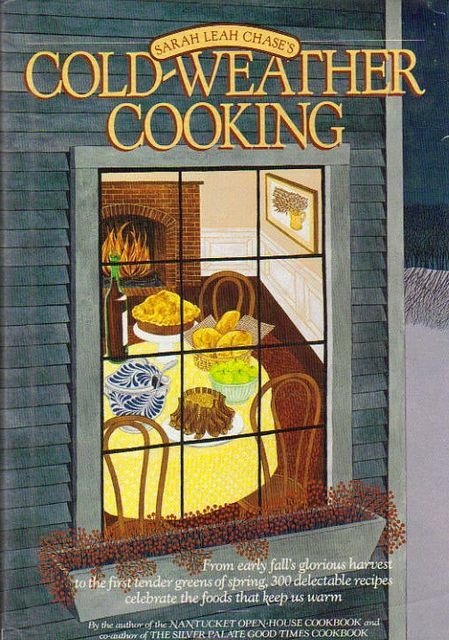 I love Sara Lee Chase's cookbooks--never tried this one though. I'm obsessed with tomatoes and cannot wait to try this. This was so yummy. It reminded me of a gorgeous tomato bread soup I ate in Florence years ago. This looks delicious! I'm excited to try it. My Grandmother used to make a similar recipe - she layered her end of the summer "bruisers" (tomatoes not pretty enough to serve sliced, or in a salad), with corn and slices of white bread slathered with butter, sugar, salt and pepper. It's the ultimate comfort food in my house and is also good served cold the next day for breakfast. I made this last night, and topped it with an oven roasted herbs de provence crusted salmon. It was super crazy good! I had left overs...thank the lord, (my hubby almost cleared out the whole dish), and this morning I slightly rewarmed them and topped them with an over medium egg....I could eat that every morning! So good, thanks for sharing, this recipe is going in the rotation for sure. So glad you liked it! That salmon sounds like a perfect match. What a great way to gratin! I have too many tomatoes in my frige and was wondering what to do with them- was beginning to tire of pasta and sauce. I am going to make this tonight! This looks terrific, can't wait to try it. Love that cookbook! In case anyone's wondering why there's a tomato dish in a book called Cold Weather Cooking, it's in a chapter called something like "So Long, Summer." She has some great soups in that book too. We LOVE tomatoes, especially late summer heirloom. So I'm vegan now and was wondering do you think it would be just as good without the parmesan on top? I do think it would still be good! The tomatoes are really what it's all about. 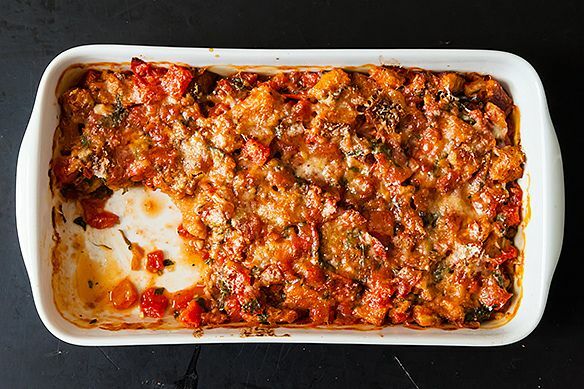 I make a similar Jacques Pepin recipe that's even easier--just toss together all the ingredients and toss in a gratin dish. It's damn good. I can attest that this recipe is indeed genius. I make it toasting the bread in olive oil, and to me it winds up tasting like all the best parts of a chicken parmesan sandwich, without the chicken. Seriously, its mega delicious!